I just have to tell you about the new album by Pipas! It's called Sorry Love and might well turn out to be the album of the year. It's been two years since the Bitter Club EP and some might have given up hope for a new record. Then out of the blue Pipas are booked to the Emmaboda festival and collect all their new songs to make up the fourth release on their own Long Lost Cousin label! I bought a copy at Emmaboda but haven't listened to it properly until now. It's just fab! Perhaps their best yet, at least as good as Chunnel Autumnal and Golden Square. It's much more textured and varied than earlier records and brimful of flowing melodies and shimmering guitars. "Windswept Room" is my favourite at the moment (that's where the title of the post is from). They've done their second song in Spanish, which is good news considering the last one "No suspires más" is one of their finest moments. A hiphop beat has never sounded as good as in "Yrrdbk", which you might have heard live already. What can you say about a line such as "adios to all that came before ba-ba-ba-ba-ba-ba-ba-ba-ba"? Those two together with "Riff Raff" were on the long lost Long Lost Tour CD and "Riff Raff" can still be downloaded from here. There's a video as well! "Boxes", I think, was on a Matinée compilation earlier. 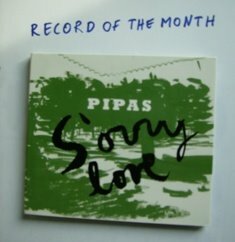 Pipas also have a new website at www.pipasforthepeople.com were you can buy Sorry Love (do it now!) and a fresh MySpace account at www.myspace.com/pipas4real. Oh, in case you're wondering, it IS less than 25 minutes long.